The Hotel de la Poste is well known for its excellent food and central village location with splendid views of the surrounding mountains. 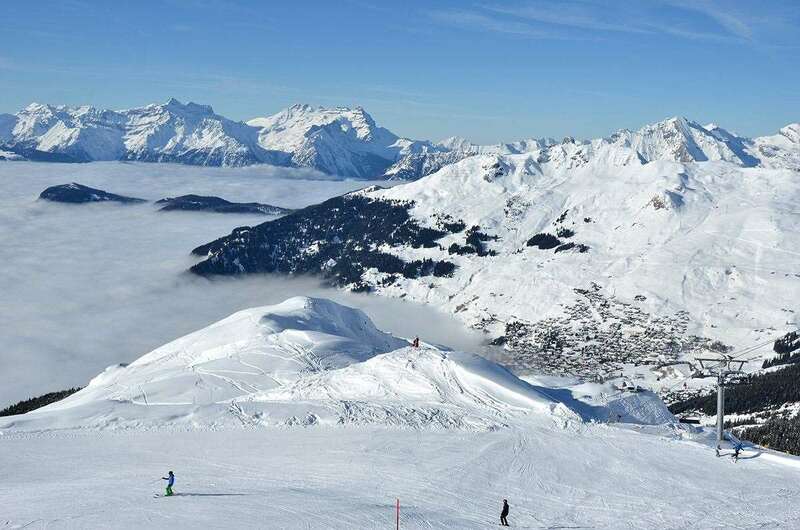 The Médran ski lifts are only 3 minutes walk away. North facing bedrooms with shower face the road and are sound-proofed. For 2 people on half board sharing a north facing twin room with private shower and WC, south facing rooms with balcony are available at a supplement. All bedrooms have satellite TV. First visit to this resort having done about 15 other alpine resorts over the past 20 years or so. The itineries (unpisted but marked runs) are needed to get you to other areas but can be very tricky in places and no turning back! We felt apri-ski could have been better - plenty of bars but mostly selling pricey Carlsberg who seemed to have a bit of a monopoly there, and didn't really have the fun factor that exists in Austrian resorts, but much better than most French ones. Main gripe was whilst a massive skiing area it is extremely difficult to access. They call it the 4 valleys - well you can see the ski areas on the other side of the valleys but can't always get to them! Needs a couple of extra cable cars! Nevertheless, still a great week, but plenty of other resorts to try before inclined to return to Verbier. Hotel de La Poste though was excellent!